Digger Derrick Competent Operator is a two-part program consisting of a comprehensive in-class theory session followed by practical operating & field testing. The program covers a broad spectrum of equipment operations, set up, augering, pole setting and removal, operation and rigging focusing on those particular to your operation. Terms & Definitions: Different terms and definitions that apply to digger derrick safety and operation. 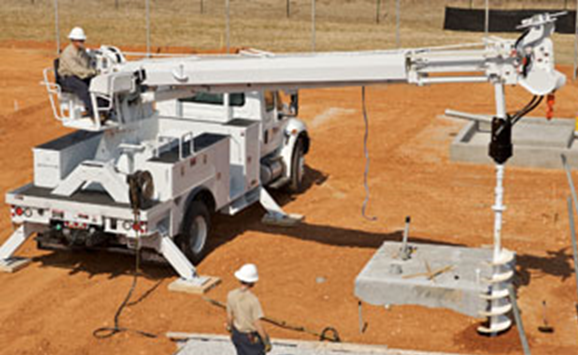 Equipment Components: Different components that apply to digger derrick safety and operation. Pre-Operational Inspection: Process for a pre-operational inspection of a digger derrick. Site Preparation: Process of preparing a site for digger derrick operation. Machine Set Up: Process of setting up a digger derrick to begin operation. Lifting Loads / Load Charts: Process of reading load charts for a digger derrick and process of lifting a load with a digger derrick. Un-stowing/Stowing Auger: Process of un-stowing and stowing the digger derrick auger. Digging Operations: Process of digging a utility pole hole with the digger derrick auger. Pole Setting: Process of setting a utility pole with a digger derrick. Underground Hazards: Different underground hazards when digging with a digger derrick and what the procedures are for determining their locations. Remote Power Tools: Different power tools that are used with digger derricks. Pole Puller: Process for pulling a pole with a digger derrick. Personnel Platforms: Process for using a personnel platform with a digger derrick. Overhead Utility Hazards: Different overhead utility hazards when operating a digger derrick and what the procedures are for working around them. Stowage & Transportation: Process for stowing the digger derrick components and tools and transporting the digger derrick. Participants will learn how to safely and effectively operate Digger Derricks and Mobile Crane/Boom crane(s), attachments and related components. This program is suitable for new and existing operators. Participants with little or no practical operating experience may require practical operator training prior to practical testing. 3-day Competent Operator Training includes both a theory and hands-on segment and may be conducted on-site at your facility or at an off-site training location.